On November 2, 1817, Mirza Husayn Ali—Baha’u’llah (ba há ool lá)—was born in Tehran, Persia. Baha’is believe that the birth of Baha’u’llah marks a new age—the return of the prophets of old, the renewal of religion and the revelation of a divine cycle destined to spread peace and unity around the globe. Baha’is see the appearance of Baha’u’llah as the return of the spiritual springtime, revivifying the souls and establishing a new Faith, a new reality and a new spiritual oneness among all humanity. The Baha’is view Baha’u’llah as the promised Lord of Hosts of the Jews; the reincarnation of Krishna and the Tenth Avatar to the Hindus; the fifth Buddha, named Maitreye, the Buddha of universal fellowship to the Buddhists; the return of Christ “in the glory of the Father” to the Christians; the return of the Imam Husayn to the Shi’a Muslims; the descent of the “Spirit of God” to the Sunnis. Baha’u’llah lived a tumultuous and inspirational life. His Faith now followed by millions in every corner of the globe, Baha’u’llah suffered tremendously for bringing the world a new, progressive, peaceful belief system. As a young man Baha’u’llah became known throughout his country as the Father of the Poor, for his extensive philanthropic work to alleviate hunger and suffering. Raised in his father’s Islamic faith, Baha’u’llah broke away from those traditions by becoming a Babi, the revolutionary new belief that promised the advent of a messenger from God who would unite the world’s peoples, nations and religions. Imprisoned and impoverished himself for those beliefs, Baha’u’llah, his family and his followers suffered through a series of subsequent banishments, repeatedly exiled by the Ottoman government from Tehran to Baghdad to Constantinople to Adrianople and finally to Akka, a prison colony in Palestine. Baha’u’llah spent the last forty years of his life, from 1852 to 1892, in prison or under house arrest. While enduring torture and privation, Baha’u’llah gradually revealed the mystical teachings and spiritual principles that formed the Baha’i Faith—the oneness of humanity, the essential unity of all religions and the love of one God for the entire creation. Baha’u’llah also taught the equality of men and women, the agreement of science and religion, and the core Baha’i concept called progressive revelation, which links all of the great Faiths throughout humanity’s history in a chain of continuous guidance from God. The Baha’i Faith spread rapidly. Despite opposition to its modern, progressive teachings from fundamentalist clergy and governments, it quickly expanded across the globe, attracting millions and becoming the world’s second-most widespread religion at the end of the 20th century. Baha’u’llah’s teachings continue to compel Baha’is everywhere to work for unity and peace. The Faith of the Blessed Beauty is summoning mankind to safety and love, to amity and peace; it hath raised up its tabernacle on the heights of the earth, and directeth its call to all nations. Wherefore, O ye who are God’s lovers, know ye the value of this precious Faith, obey its teachings, walk in this road that is drawn straight, and show ye this way to the people. Lift up your voices and sing out the song of the Kingdom. Spread far and wide the precepts and counsels of the loving Lord, so that this world will change into another world, and this darksome earth will be flooded with light, and the dead body of mankind will arise and live; so that every soul will ask for immortality, through the holy breaths of God. – Abdu’l-Baha, Selections from the Writings of Abdu’l-Baha, p. 1. 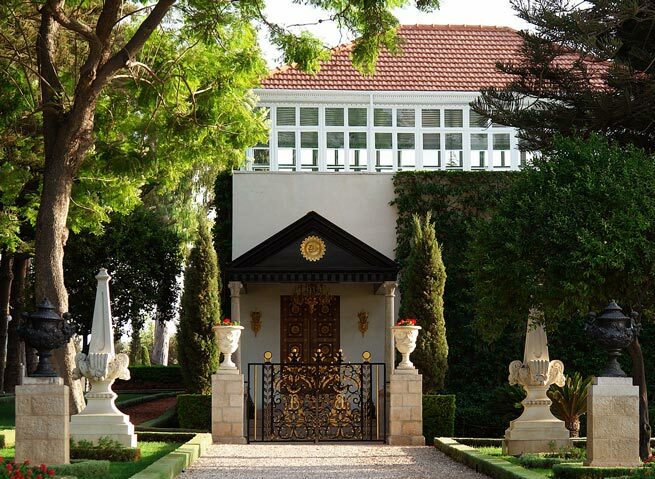 The Shrine of Baha’u’llah, located in Bahjí near Acre, Israel. Baha’u’llah, the prophet and founder of the Baha’i Faith, passed away in 1892. Exiled by the Ottoman government to Palestine in 1868, Baha’u’llah and his family spent many years imprisoned in the old prison colony and walled fortress of Akka, until authorities relaxed the prison conditions and allowed Baha’u’llah to move. In 1879 Baha’u’llah relocated to a rural property north of Akka called Bahji—which means “delight” in Arabic—even though his movements were still restricted under the government’s imposition of house arrest. In that place, where Baha’u’llah spent the last dozen years of his life, stands the Shrine of Baha’u’llah, his burial place and, to his followers, the most sacred spot on Earth. Basically a small, modest outbuilding on the grounds of Bahji, the Shrine of Baha’u’llah has become a point of pilgrimage for the world’s Baha’is. Baha’is all over the globe turn towards that spot every day in prayer. Surrounded by beautiful terraces and gardens, which bloom year-round in what is now northern Israel, the sacred site constantly receives visitors from all over the world. Baha’is travel there to pray and meditate, and to pay their respects to the founder of their Faith. Unlike the previous prophets of the world’s great Faiths, Baha’u’llah wrote extensively—more than a hundred volumes, comprised of 15,000 separate works! This prodigious output is, without question, the most prolific repository of sacred scripture known to humanity. Beyond the sheer volume of his works, Baha’u’llah’s beautiful language, poetic style and revelatory dynamism fill his sacred writings with enormous significance and power. Baha’is regard each one of Baha’u’llah’s written works, whether short letters and tablets or much longer complete books, as authentic parts of the Baha’i revelation. This divine outpouring of knowledge and inspiration, unparalleled in past religions, has tremendous implications for spiritual growth, mystical insight and the future achievement of the unified global civilization that Baha’u’llah advocated and envisioned. Baha’u’llah’s major works cover a wide range of subjects: mystical treatises and aphorisms like The Seven Valleys, The Four Valleys and The Hidden Words; the proclamation of Baha’u’llah’s mission in books like The Proclamation of Baha’u’llah and The Summons of the Lord of Hosts; books on the subject of theology, progressive revelation and the essential unity of all Faiths like The Book of Certitude and Epistle to the Son of the Wolf; books on Baha’i law and the future state of society, especially The Most Holy Book, also known in Arabic as the Kitab-i-Aqdas; poetic, visionary volumes like Gems of Divine Mysteries; books of supplications to the Creator like Prayers and Meditations of Baha’u’llah; and compilations of various important letters, missives and tablets like Gleanings from the Writings of Baha’u’llah and Tablets of Baha’u’llah. O Son of Spirit! My first counsel is this: Possess a pure, kindly and radiant heart, that thine may be a sovereignty ancient, imperishable and everlasting. – The Hidden Words, p. 3. They that are endued with sincerity and faithfulness should associate with all the peoples and kindreds of the earth with joy and radiance, inasmuch as consorting with people hath promoted and will continue to promote unity and concord, which in turn are conducive to the maintenance of order in the world and to the regeneration of nations. Blessed are such as hold fast to the cord of kindliness and tender mercy and are free from animosity and hatred. – Tablets of Baha’u’llah, p. 35. That one indeed is a man who, today, dedicateth himself to the service of the entire human race. The Great Being saith: Blessed and happy is he that ariseth to promote the best interests of the peoples and kindreds of the earth. In another passage He hath proclaimed: It is not for him to pride himself who loveth his own country, but rather for him who loveth the whole world. The earth is but one country, and mankind its citizens. – Gleanings from the Writings of Baha’u’llah, p. 250. Examine the wondrous behaviour of the Prophets, and recall the defamations and denials uttered by the children of negation and falsehood, perchance you may cause the bird of the human heart to wing its flight away from the abodes of heedlessness and doubt unto the nest of faith and certainty, and drink deep from the pure waters of ancient wisdom, and partake of the fruit of the tree of divine knowledge. Such is the share of the pure in heart of the bread that hath descended from the realms of eternity and holiness. – The Book of Certitude, pp. 5-6. Love accepteth no existence and wisheth no life: He seeth life in death, and in shame seeketh glory. To merit the madness of love, man must abound in sanity; to merit the bonds of the Friend, he must be full of spirit. Blessed the neck that is caught in His noose, happy the head that falleth on the dust in the pathway of His love. Wherefore, O friend, give up thy self that thou mayest find the Peerless One, pass by this mortal earth that thou mayest seek a home in the nest of heaven. Be as naught, if thou wouldst kindle the fire of being and be fit for the pathway of love. – The Seven Valleys, pp. 9-10. Visit the Official Baha’i Website on the life of Baha’u’llah.